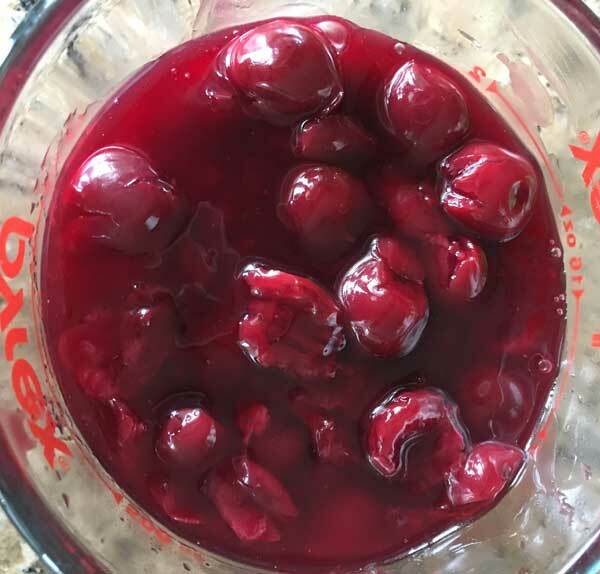 If you ever want to make a cherry pie using Trader Joe’s Dark Morello Cherries, here’s an easy and fairly quick recipe. 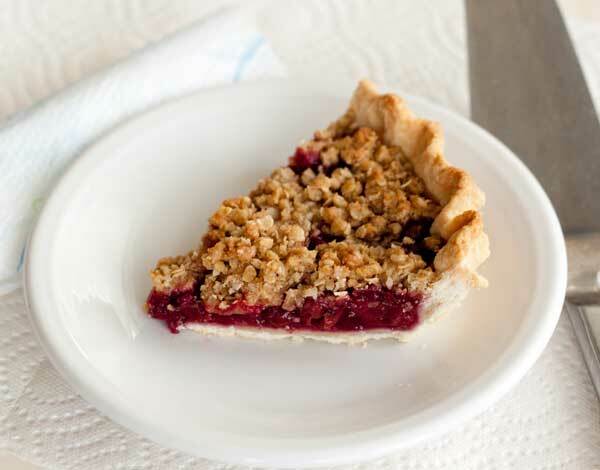 It’s a cherry crumb pie, which in this case means a regular pastry crust, a cherry filling and a crumb topping. 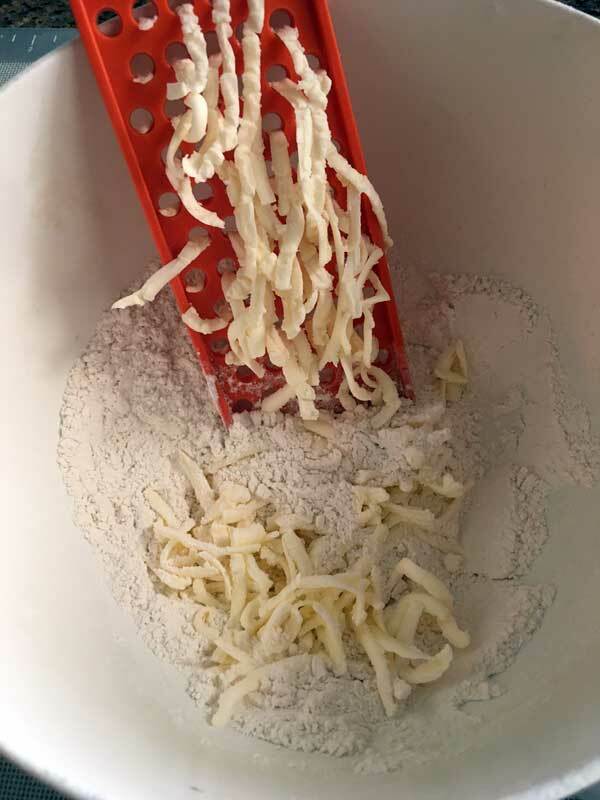 The dough is a basic all butter pie dough made with one of my favorite methods — grating the butter into the flour mixture. This is so much easier than cutting it in with a pastry cutter. I use this orange, plastic grater/shredder which is much sharper than it looks. The cherry filling is made with Aldi or Trader Joe’s Dark Morello Cherries, which are relatively inexpensive and available all year long. I use this as both pie filling and as a topping for cheesecakes. And here’s a cherry crumb pie that’s ready to eat! Sorry about the bad lighting. I took these photos at night and don’t have a lighting studio set up. For the pie dish, I wouldn’t recommend using anything larger than 9 inches. I used one of the disposable pie tins I ordered last week from Webstaurant. I bought a pack of 50 for $10.49 (plus shipping, so I bought a few other things to make it worthwhile). But I’m planning on giving away a lot of pies this season, so these should come in handy. 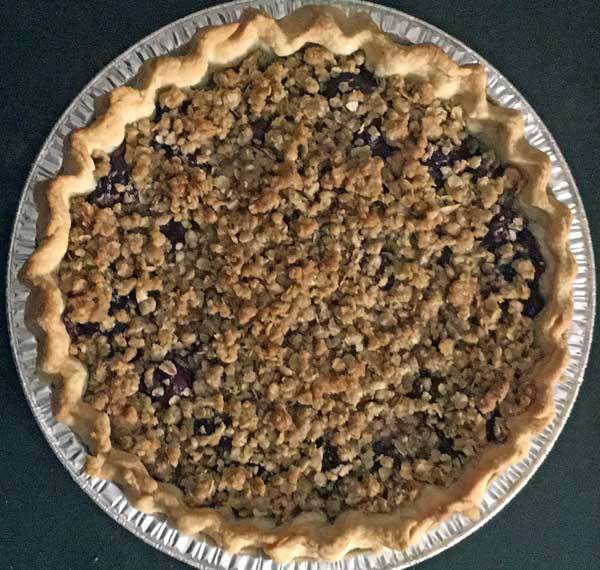 An easy Cherry Crumb Pie made with Trader Joe's Dark Morello Cherries. If you can't find the Trader Joe's cherries, canned cherries in light syrup should work just fine, though you'll have to buy two cans. Stir the flour, sugar and salt together in a large bowl. Grate or shred the cold butter over the flour mixture, stopping occasionally to toss butter with flour mixture. When the whole stick of butter has been added, stir mixture with a fork or use your fingers to make the mixture evenly coarse. Add water 1 tablespoon at a time and stir with a heavy duty scraper until dough comes together. Shape into ball. Wrap in plastic and keep chilled until ready to use or use immediately. Filling: Separate syrup from cherries and measure out 3/4 cup of the syrup. In a large saucepan, stir together sugar and cornstarch. Whisk in the cherry syrup, then set over medium heat. Whisk the mixture until it thickens and becomes translucent. Remove from heat and stir in butter, lemon juice and extract, then stir in the drained cherries. Pie Assembly: Preheat the oven to 400 degrees F. and put a heavy rimmed baking sheet in the oven. You'll be baking the pie on the hot, preheated cookie sheet (which is supposed to help keep the crust crisp). On a lightly floured surface, roll dough into a 12 inch circle. Transfer to a 9 inch round pie tin and crimp edges. Pour filling in the center of the pie. 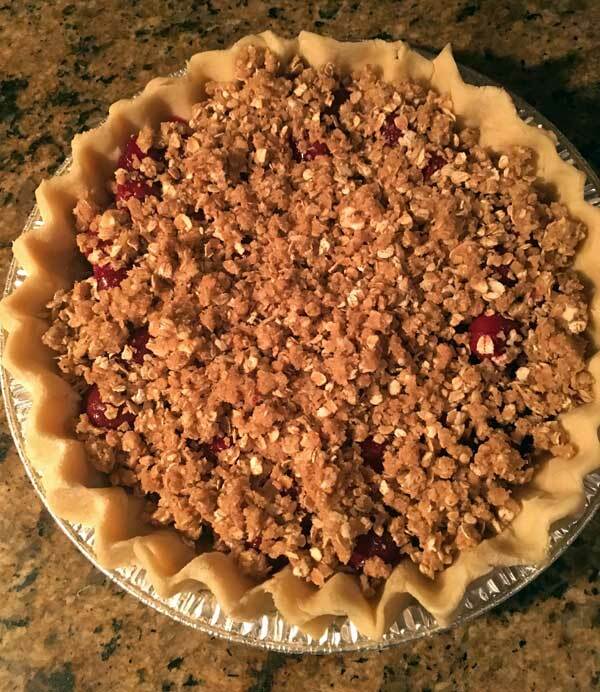 Topping: Combine the flour, oats, sugar, salt and cinnamon in the bowl you used for your pie crust. Add butter and stir until crumbly, then sprinkle over pie filling. Set the pie on the hot baking sheet and put it in the oven. Reduce the heat to 375 degrees F. and bake for 40 minutes. Check after 30 minutes to make sure your crumb topping isn't browning too quickly. If it is, lay a sheet of foil over it. I’m so happy to hear that, Kathleen! Thanks for the tip on increasing the cherries. I hope your sister likes the recipe. Glad you liked it, Allison! I’ll fix the cinnamon issue. Holy crap…this came out so good. It was really worth the effort. I am saving this recipe and doing it again. The only comment I have is that the crumb topping asks for cinnamon in the directions but not in the ingredients, so I kept reading the ingredients thinking I was reading something wrong. Either way, I just put in what I thought was best and it was perfect. Thanks! Yeah, definitely had to double up on the filling. Glad I bought two jars at the store, because I made it to recipe and it definitely wasn’t enough! Carrie, that’s great! Those cherries are so convenient, aren’t they? This is literally the best cherry pie I’ve ever eaten. Perfect balance of tart/sweet and the crust is amazing! Highly recommend! Just made this pie. I doubled it as my pie dish is a more of a deep dish. Instead of the crumb topping I made a traditional lattice top. The filling cooked up and thickened nicely- took a few minutes so if you haven’t done this before- make sure you cook long enough til it thickens- you can tell! I bought the Trader Joe cherries and they are $2.49 a jar in my local T.J’s ( east coast). They are really good. I had been asked to make a cherry pie and the only other time I made one I used canned and thought they tasted slightly metallic so was wondering about the ones in T.Joes. Thank you so much for posting the recipe! Dang, I was just at TJ’s yesterday, but didn’t see/buy the cherries. I only get up to it once a month. Cherry pie is a favorite around here, but no one is loving the canned cherries anymore (they used to be fine with it). Will have to try this pie. I’ll be back up to TJ’s before Christmas, so that will work. Yum! I made a similar recipe a few times from the King Arthur Flour Whole Grain Baking Cookbook, and liked the crisp topping so much that I made a bunch of my other cobbler recipes with a crisp topping instead! It is so good with cherry pie! And Cook’s Illustrated found that Trader Joe’s morello cherries are the best brand for baking! Since these cherries end up tasting like cranberries how do you think they would work in an apple cranberry crisp? They do kind of taste like cranberries! Ha! I was just thinking that while tasting a bit today. Still, for the value I’ll take them. There’s nothing like fresh cherries, but the Morello ones are just so much easier to get all year round. Also, this was the first pie pan I used from the big stack of 50 I ordered. I was surprised at how durable it was. After I cooked the pie, chilled it overnight and froze the individual slice, the disposable pie pan was still in really good shape. I’ll probably use it again. Sue, next time you have some over-ripe bananas you should try it. The Mexican Chocolate Banana Bread looks great too. It would be a really nice option on a quick bread plate for tea time. I think comments are turned off on that post. This looks like a great recipe! Thanks! It’s just incredible how well these cherries hold up during the baking process. One interesting thing I’ve found is that they sometimes end up tasting like cranberries as opposed to cherries. How do you feel the disposable pie pans hold up in baking? I want to give away pies too, but that’s always been one of the hang-ups. Thanks!